Although the entire Christmas season is generally a magical time, there is something spectacular about Christmas Eve. When I was growing up, I had many favorite Christmas traditions: baking, decorating and delivering Christmas cookies to some of the elderly members of our church; listening to Chrsitmas music; watching Jimmy Stewart in It’s a Wonderful Life or Bing Crosby in White Christmas (and, for some strange reason, The Sound of Music ) all of which came on the TV as this was before the time of VCRs and DVD players. Singing Christmas carols at church all through December; pulling decorations out of the box and hearing my mother recount where she had gotten them; caroling around the tiny village with my church; sipping hot chocolate in the glow of the Christmas lights. These were a few of my favorite things. But there was one special thing about Christmas in my family that seemed to make the holiday extra exciting. My mother is a Christmas Eve baby. I was always slightly jealous of my mother’s Christmas Eve birthday. How wonderful it seemed to me to be able to share a birthday with the baby Jesus! The lights, the decorations, the foods, the carols, the parties and gifts … why all of those wonderful activities and traditions must make a Christmas birthday seem to last forever! And who wouldn’t want to extend their birthday celebration out for as long as possible? The countdown to my September birthday began as soon as school started in mid-August. I was prone to making construction paper chains, snipping one strip off each day as a way of marking the time. I remember always hoping to receive lots of birthday gifts, delighting in the fact that inevitably I would be the center of attention on the day of my birthday. But my mother never expected anyone to remember or make a fuss over her birthday. She didn’t seem to care if she only got one gift labeled for both birthday and Christmas among all the wrapped presents under the tree, and seemed to actually prefer to think about what good things she could do for others instead of thinking about how people might pay attention to her. And perhaps most of all, she seemed to insist that her three children put our Christmas focus on the Christmas Child in the manger and the reason for His Holy birth. 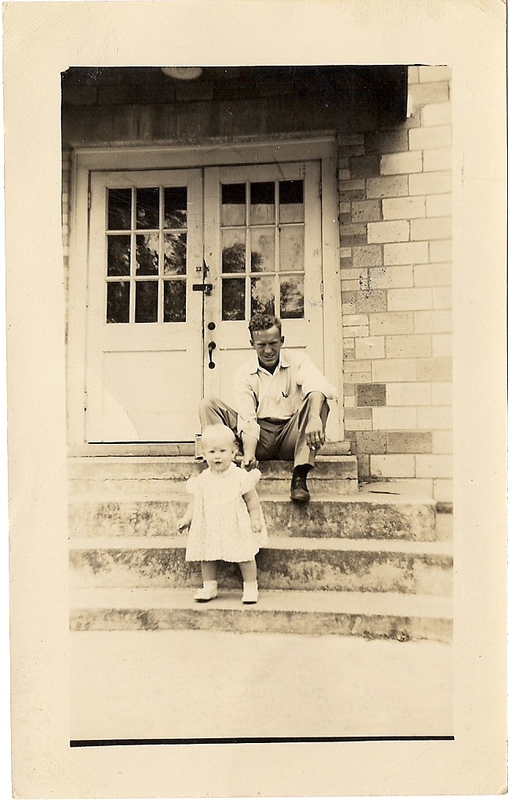 My mom as a toddler … pictured with her father. Tucked away in her wedding album was a letter, written in my grandmother’s beautiful cursive, the paper yellowed and dated December 24th of the year my mom turned 4 years old. Most Christmases, I pulled it out and read it to myself, wondering about the little girl who had grown up to be my mother. I would looked longingly at the old photos of her childhood, thinking how her white-blonde hair, bright blue eyes and sweet smile gave her the appearance of a tiny angel without wings. The long letter basically recounted my mother’s 4th birthday party, an event in which all the neighborhood children came because Santa was going to be there. When it came my mother’s turn to sit on Santa’s knee, she asked him to bring a doll to a little girl who didn’t have one to play with … my grandmother recorded her as saying, “I already have a lot of dolls and toys.” Even my grandmother seemed to marvel at her oldest daughter’s generosity. As a child, I believed that my mother got to share her birthday with Jesus because she was so very lovely and good … and I wished I could be that lovely, too. I know my mom will read this and later on tell me that she doesn’t know where I get my ideas from, but I know deep down how wonderfully special my mom truly is. She has a generous spirit, full of concern and love for others. She is gentle, selfless, kind, and unassuming. Her outlook on life is positive and full of hope for the future. And yet, as wonderful as my mother is, her Christmas Eve birthday is NOT the reason for the celebration. It’s another birthday that must always take center-stage … the birthday of Jesus Christ, Emmanuel, God with us. The only thing is that Jesus can’t be just the reason for the season. He needs to be the reason for our every action, every day of the year. And tonight, as I think about my mother (of whose birth it is said was so late on Christmas Eve that she was nearly a Christmas Day baby), I feel so very grateful that she taught me the importance of loving and worshipping the Holy Baby in the manger every day of the year. May you celebrate the birth of Christ today, tomorrow and every day to come … Merry Christmas and joy to the world! Paige, I wish you and your entire family a most blessed Christmas. I’m glad you can be at home for your mom’s birthday and Christmas. Enjoy!!! Hope you had a blessed Christmas and New Year, Levi! It’s been a holiday to remember for sure … I’m glad it is over, but I’m thankful for each moment I got to share with those I love. It was all good, Paige. Thanks! Im happy you were able to spend yours with your mom and loved ones. I agree, theres no place like home. Rest up, if you can get a chance. Lol. Lord bless. Reposting my Christmas Eve post from last year … because I couldn’t think of a way to say it any better this year. Happy birthday to my beautiful mother and the merriest Christmas wishes to my family, friends, and blog followers! May your celebrations be focused on the One who brought us the greatest gift of all! I agree 100% about your mom. Well done!